Consider this problem: Fix a regular expression R. Suppose you have a string of length N. There's not much you can do about it, you'll likely have to scan all N characters to test so see if the string matches R. But once you've performed the test, how fast can you test the string again if a small edit is made to it? It seems that in general you'd have to rescan the entire string, or at least rescan from where the edit was made. But it turns out that you can do regular expression matching incrementally so that for many changes you might make to the string, you only require O(log N) time to recompute whether the string matches. This is true even if characters at opposite ends of the string interact to make a succcessful match. What's more, it's remarkably straightforward to implement if we make use of fingertrees and monoids. I'm going to assume a bit of background for which resources can be found on the web: understanding some basics about monoids, understanding apfelmus's inspiring introduction to fingertrees or the original paper, and you'll need to be completely comfortable with the idea of compiling regular expressions to finite state machines. As usual, this is literate Haskell. But you need to have the fingertree package installed and we need a bunch of imports. So let's start with an example regular expression: .*(.*007.*).*. We're looking for "007" enclosed between parentheses, but the parentheses could be millions of characters apart. I've used the convention that an unlabelled edge corresponds to any input that isn't matched by another labelled edge. We can express the transitions as a function fsm. The initial state is 0 and a match corresponds to state 5. Try matches "(00 7)" and matches "He(007xxxxxxxxxxxx)llo". We can thing of the inputs as being functions acting on the automaton. Each input character is a function that maps the automaton from one state to another. We could use the Haskell composition function, (. ), to compose these functions. But (.) doesn't really do anything, f . g is just a closure that says "when the time comes, apply g and then f.
Note that we've cheated a bit. An object of type Table could be any array of Ints indexed by Int. But if we promise to only build arrays indexed by elements of [0..5] and containing elements of the same range then our claim to monoidhood is valid. This is slower and more complex than our original implementation of matches. But what we've now done is 'tease out' a monoid structure from the problem. If we store a string as a sequence of characters represented by a fingertree, we can store in each subtree the element of Table corresponding to the substring it represents. Every time the tree is rebalanced we need to recompute the corresponding Tables. But that's fine, it typically involves only O(log N) operations, and we don't need to write any code, the fingertree will do it for us automatically. Once we've done this, we end up with a representation of strings with the property that we always know what the corresponding Table is. We can freely split and join such trees knowing that the Table will always be up to date. The only slight complication is that I want to be able to randomly access the nth character of the tree. apfelmus explains that in his post. The change I need to make is that I'm going to use both the Size monoid and the Table monoid, so I need the product monoid. Note how I project out the size from the product monoid in order to insert at the correct position. Note there is quite an overhead for this example. I'm storing an entire Table for each character. But you can easily store chunks of string (like in a rope). This means that some chunks will be rescanned when a string is edited - but rescanning a 1K chunk, say, is a lot less expensive than scanning a gigabyte file in its entirety. Working in blocks will probably speed up the initial scan too, a much smaller tree needs to be built. When Hinze and Patterson originally wrote the fingertree paper they were motivated by parallel prefix sum methods. Just about any parallel prefix algorithm can be converted to an incremental algorithm using fingertrees. This article is based on the idea of doing this with the parallel lexing scheme described by Hillis and Steele in their classic Connection Machine paper. So why would you want to match against a fixed regular expression like this? Well this method extends to a full blown incremental lexer. This will lex quickly even if placing a character in a string changes the type of lexemes billions of characters away. See the Hillis and Steele paper for details. Note there's nothing especially Haskelly about this code except that Haskell made it easy to prototype. You can do this in C++, say, using mutable red-black trees. Haskell is a great language for constructing code modularly from small but orthogonal building blocks. One of these small blocks is the monoid. Although monoids come from mathematics (algebra in particular) they are found everywhere in computing. You probably use one or two monoids implicitly with every line of code you write, whatever the language, but you might not know it yet. By making them explicit we find interesting new ways of constructing those lines of code. In particular, ways that are often easier to both read and write. So the following is an intro to monoids in Haskell. I'm assuming familiarity with type classes, because Haskell monoids form a type class. I also assume some familiarity with monads, though nothing too complex. This post is literate Haskell so you can play with the examples directly. In Haskell, a monoid is a type with a rule for how two elements of that type can be combined to make another element of the same type. To be a monoid there also needs to be an element that you can think of as representing 'nothing' in the sense that when it's combined with other elements it leaves the other element unchanged. A great example is lists. Given two lists, say [1,2] and [3,4], you can join them together using ++ to get [1,2,3,4]. There's also the empty list . Using ++ to combine  with any list gives you back the same list, for example ++[1,2,3,4]==[1,2,3,4]. Another example is the type of integers, Integer. Given two elements, say 3 and 4, we can combine them with + to get 7. We also have the element 0 which when added to any other integer leaves it unchanged. mempty `mappend` a = a.
and you can summarise it with the slogan 'combining on the left doesn't interfere with combining on the right'. Notice how the integers, combined with +, also have this property. It's such a useful property it has a name: associativity. That's a complete specification of what a monoid is. Haskell doesn't enfore the three laws I've given, but anyone reading code using a monoid will expect these laws to hold. But given that we already have individual functions like ++ and +, why would we ever want to use mappend instead? One reason is that with a monoid we get another function called mconcat for free. mconcat takes a list of values in a monoid and combines them all together. For example mconcat [a,b,c] is equal to a `mappend` (b `mappend` c). Any time you have a monoid you have this quick and easy way to combine a whole list together. But note that there is some ambiguity in the idea behind mconcat. To compute mconcat [a,b,...,c,d] which order should we work in? Should we work from left to right and compute a `mappend` b first? Or should we start with c `mappend` d. That's one place where the associativity law comes in: it makes no difference. Another place where you might want to use a monoid is in code that is agnostic about how you want to combine elements. Just as mconcat works with any monoid, you might want to write your own code that works with any monoid. Explicitly using the Monoid type class for a function also tells the reader of your code what your intentions are. If a function has signature [a] -> b you know it takes a list and constructs an object of type b from it. But it has considerable freedom in what it can do with your list. But if you see a function of type (Monoid a) => a -> b, even if it is only used with lists, we know what kind of things the function will do with the list. For example, we know that the function might add things to your list, but it's never going to pull any elements out of your list. To use these we wrap our values in the appropriate wrapper and we can then use the monoid functions. For example mconcat [Sum 2,Sum 3,Sum 4] is Sum 9, but mconcat [Product 2,Product 3,Product 4] is [Product 24]. Using Sum and Product looks like a complicated way to do ordinary addition and multiplication. Why do things that way? You can think of monoids as being accumulators. Given a running total, n, we can add in a new value a to get a new running total n' = n `mappend` a. Accumulating totals is a very common design pattern in real code so it's useful to abstract this idea. This is exactly what the Writer monad allows. We can write monadic code that accumulates values as a "side effect". The function to perform the accumulation is (somewhat confusingly) called tell. Here's an example where we're logging a trace of what we're doing. >   tell $ "We've taken one away from " ++ show n ++ "\n"
>   tell $ "We've called f " ++ show m ++ "\n"
>   tell $ "We've multiplied " ++ show n ++ " and " ++ show m ++ "\n"
we get back both 10! and a list of what it took to compute this. It works just as well, but there is a big advantage to using the Writer version. It has type signature f :: Integer -> Writer (Sum Integer) Integer. We can immediately read from this that our function has a side effect that involves accumulating a number in a purely additive way. It's never going to, for example, multiply the accumulated value. The type information tells us a lot about what is going on inside the function without us having to read a single line of the implementation. The version written with State is free to do whatever it likes with the accumulated value and so it's harder to discern its purpose. Data.Monoid also provides an Any monoid. This is the Bool type with the disjunction operator, better known as ||. The idea behind the name is that if you combine together any collection of elements of type Any then the result is Any True precisely when at least any one of the original elements is Any True. If we think of these values as accumulators then they provide a kind of one way switch. We start accumulating with mempty, ie. Any False, and we can think of this as being the switch being off. Any time we accumulate Any True into our running 'total' the switch is turned on. This switch can never be switched off again by accumulating any more values. This models a pattern we often see in code: a flag that we want to switch on, as a side effect, if a certain condition is met at any point. At the end of our calculation we get n!, but we are also told if at any stage in the calculation two numbers were multiplied to give 120. We can almost read the tell line as if it were English: "tell my caller if any value of r is ever 120". Not only do we get the plumbing for this flag with a minimal amount of code. If we look at the type for this version of f it tells us exactly what's going on. We can read off immediately that this function, as a "side effect", computes a flag that can be turned on, but never turned off. That's a lot of useful information from just a type signature. In many other programming languages we might expect to see a boolean in the type signature, but we'd be forced to read the code to get any idea of how it will be used. Two elements of a monoid, x and y, are said to commute if x `mappend` y == y `mappend` x. The monoid itself is said to be commutative if all of its elements commute with each other. A good example of a commutative monoid is the type of integers. For any pair of integers, a+b==b+a. >   tell $ Dual $ "We've taken one away from " ++ show n ++ "\n"
>   tell $ Dual $ "We've called f " ++ show m ++ "\n"
>   tell $ Dual $ "We've multiplied " ++ show n ++ " and " ++ show m ++ "\n"
>   tellFst $ "We've taken one away from " ++ show n ++ "\n"
>   tellFst $ "We've multiplied " ++ show n ++ " and " ++ show m ++ "\n"
If we had simply implemented our code using one specific monoid, like lists, our code would be very limited in its application. But by using the general Monoid type class we ensure that users of our code can use not just any individual monoid, but even multiple monoids. This can make for more efficient code because it means we can perform multiple accumulations while traversing a data structure once. And yet we still ensure readability because our code is written using the interface to a single monoid making our algorithms simpler to read. Note, of course, that these expressions can be used, unmodified, with any foldable type, not just trees. I hope you agree that this expresses our intentions in a way that is easy to read. That suggests another exercise: write something similar to find the minimum or maximum element in a tree. You may need to construct a new monoid along the lines of Any and All. Try finding both in one traversal of the tree using the product monoid. The foldable example also illustrates another point. The implementor of foldMap for the tree doesn't need to worry about whether the left tree should be combined with the central element before the right tree. Associativity means it can be implemented either way and give the same results. Monoids provide a general approach to combining and accumulating values. They allow us to write code that is agnostic about the method we will use to combine values, and that makes our code more reusable. By using named monoids we can write type signatures that express our intentions to people reading our code: for example by using Any instead of Bool we make it clear just how our boolean value is to be used. And we can combine the monoid-based building blocks provided by Haskell libraries to build useful and readable algorithms with a minimum of effort. Some final notes: mathematicians often refer to mappend as a 'binary operator' and often it's called 'multiplication'. Just like in ordinary algebra, it's often also written with abuttal or using the star operator, ie. ab and a*b might both represent a `mappend` b. You can read more about monoids at Wikipedia. And I wish I had time to talk about monoid morphisms, and why the list monoid is free (and what consequences that might have for how you can your write code), and how compositing gives you monoids and a whole lot more. The rest of the post will fill in the details. The type declaration tells us what role it plays syntactically, ie. it tells us how we can write code with extract that type checks. But what should the semantics be? For the IO monad an answer is easy to guess. 1 + extract (readLn :: IO Int) should execute readLn by reading n integer from stdin, strip of the IO part of the the return value and then add 1 to the result. In fact, Haskell already has a function that does exactly that, unsafePerformIO. The goal here is to implement extract in a way that works with any monad. What might we expect the value of 1 + extract [1,2,3] to be? The value of extract [1,2,3] surely must be 1, 2 or 3. But which one? And what happens if the list is empty? There really isn't any way of answering this while remaining *purely* functional. But if we were running code on a suitable machine we could fork three threads returning one of 1, 2 and 3 in each thread, and then collecing th results together in a list. In other words, we'd expect the final result to be [2,3,4]. This would make extract a lot like McCarthy's ambiguous operator. So it's clear that we can't interpret extract as a pure function. But we could try implementing it on a new abstract machine. But there's another approach we could take. A couple of times I've talked about a function of type ~~a -> a where ~a is the type a -> Void and Void is the type with no elements. This corresponds to double negation elimination in classical logic. The Curry-Howard isomorphism tells us no such function can be implemented in a pure functional language, but we can translate expressions containing references to such a function into expressions that are completely pure. This is the so-called CPS translation. Anyway, I had this idea that we could do something limilar with monads so that we could translate expressions containing extract into ordinary Haskell code. 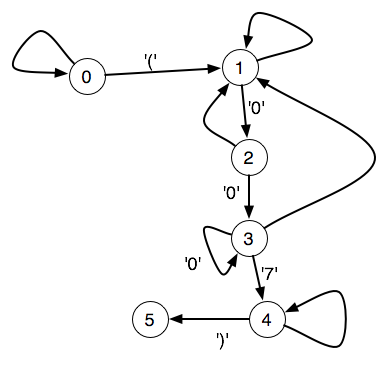 Turns out there's already a paper on how to do this: Representing Monads by Andrzej Filinski. The important thing is that extract of type m a -> a is replaced by join of type m (m a) -> m a. And list operations. For example [a,b,c] is sugar for a : b : c : . If the above is placed in a file called Test.lhs then you can try compiling the following code. The big omission is the lack of translation for lambda abstractions. I think that to get this right might requires translating all of the code using -|extract|- from the ground up, not just isolated expressions like those above. And like with CPS, you lose referential transparency and the order in which expressions are evaluated makes a difference. Anyway, this is a partial answer to the question posed here on "automonadization".